CAMBRIDGE, Md.–Get your fork and knife ready because the Hyatt Regency Resort in Cambridge is serving up some tasty dishes this holiday season with the help of a new Executive Sous Chef! 47 ABC’s Erica Murphy was joined by Keisha West, the new executive sous chef, and Nicole Vienneau, their communications manager, to talk about some tasty food and family fun events. Throughout the month of December, children will get to visit with Santa, work on their wish lists, decorate cookies, and even watch a movie while floating in the indoor pool! Adults will have their own kind of fun too, with things like the Ugly Sweater Contest and Holiday Mixology classes at Eagle’s Nest Bar & Grille. 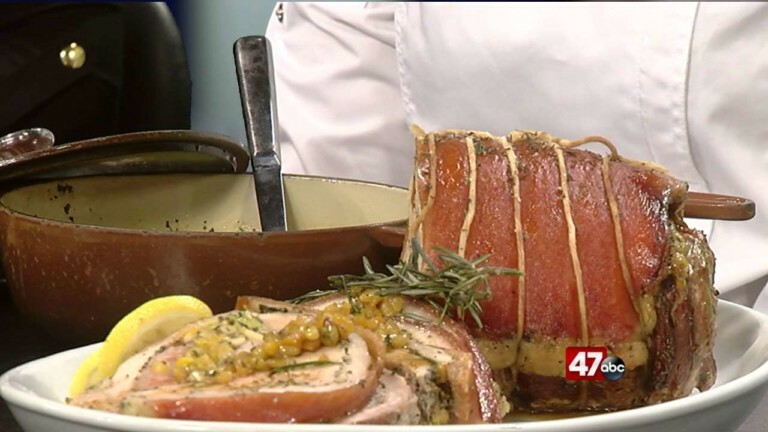 During Good Morning Delmarva, Keisha brought in a Porchetta which is pork belly with loin attached. Want to learn how to make the porchetta? Check out the recipe below courtesy of the Hyatt! Stuff the pork mid-section with the spices and wrap it in the skin. Let the prochetta rest for at least 10 minutes and – Enjoy the feast!!!! !